HomeGadgetsJugaadLifestyleWelfareAn Indian Farmer Invents a Low Cost Milk ATM for Farmers! An Indian Farmer Invents a Low Cost Milk ATM for Farmers! Milk vending machines are not new, but a low-cost Milk ATM built by the farmer for the farmer is. 28-year-old Class XI dropout Nilesh Gussar, a farmer from Gujarat, India has developed the indigenous milk dispensing machine. Earlier it was milkman Kurien in Anand the founder of Amul now milk ATM man Nilesh. Farmers are the real backbone & Soul of any country. And now "Nilesh Gussar" have raised to next level. According to Gussar, farmers can get one-and-half-times more price for their milk using the milk ATMs as they can fix the rate for the produce. "Farmers can recover the cost of the machine within a year. That is why farmers having more than three buffaloes or cows prefer this machine," claimed Nilesh. Depending on its carrying capacity, which extends from 50-250 liters, each Milk ATM costs in the range of Rs 75,000 to Rs 1,50,000. He has further enhanced the system by creating its cashless version. Besides refrigeration, the milk ATMs have battery backup in case of power failure. It gives users options to dispense milk — biometric fingerprinting, username and password or through a prepaid card. The first version of the machine accepted only currency notes of Rs 20, Rs 50 and Rs 100 denominations to dispense milk. 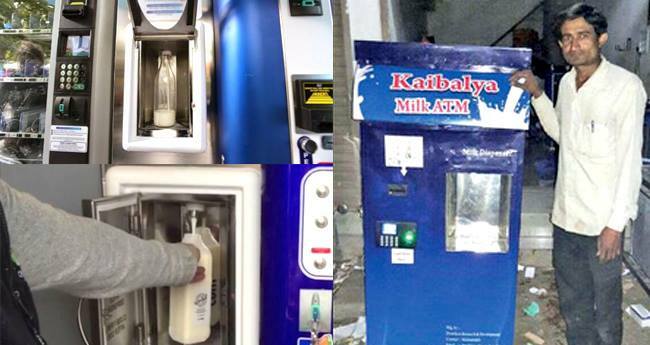 These milk ATMs are gaining popularity among farmers who don't want to sell milk to dairies. Now they can sell milk at their own rates rather than depending on middlemen or dairy cooperatives. He had first assembled the milk ATM for his own use. Soon it became popular and he has sold over 30 machines. For someone who has never had formal training in engineering, this is a remarkable achievement. As is usually the case, this innovation came from a rural area, and not from any hi-tech engineering company, or engineering college. This is why governments need to concentrate on development in the rural areas, rather than more urbanization. Such innovation required to farmers who can avoid middlemen and can get correct price for their products. It may in turn help in reduction of price rise. Similar innovations need to be encouraged and appreciated.